There are tons of salsa recipes available. If you have a favorite, you’re probably not reading this. If you don’t have a favorite, then the most likely best thing to do if you know of a salsa you like is ask the person or restaurant who made it for the recipe. The worst that could happen is they won’t give you the recipe. Aside from that, here’s a simple one. I make it to find a use for my small food processor and because it’s good. (Oster 3320 150-Watt 3-Cup Food Chopper with Whisk Attachment ). However you could probably do just as well with a knife, cutting board, bowl and spoon. Chop onion and garlic in food processor for about 15 seconds. 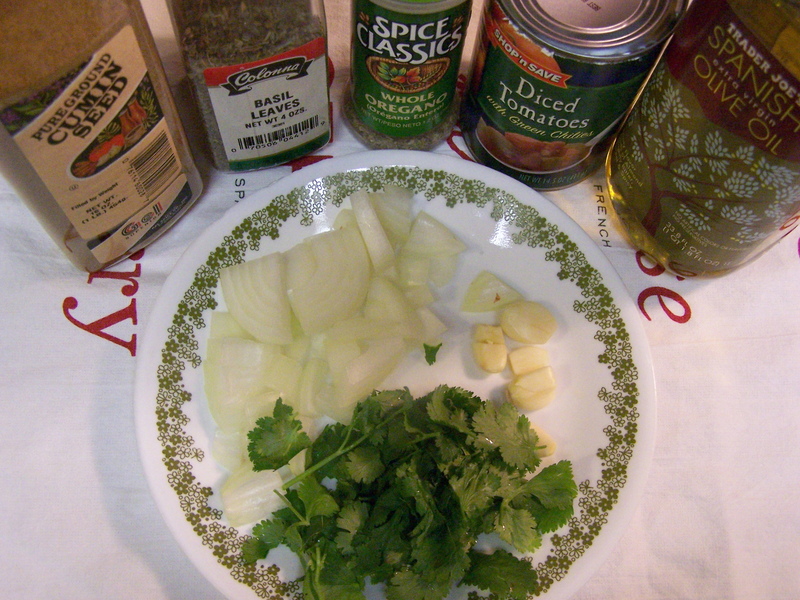 Add olive oil, cilantro, oregano and cumin, chop for another 15 seconds. 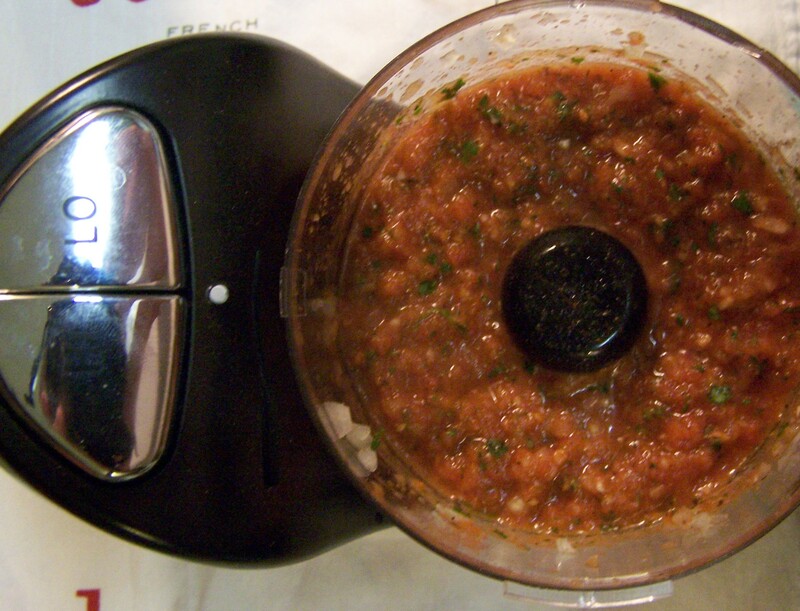 Add drained tomatoes, chop for about 20-30 seconds on high until desired consistency. Add another teaspoon olive oil to thin, if desired. Adjust bite with more or less garlic and onion. Add your own favorite chiles or use plain diced tomatoes to moderate hotness. This entry was posted on 12/26/2009 at 02:19 and is filed under Recipes, Recipes, food, cooking and related items, Vegetarian. You can follow any responses to this entry through the RSS 2.0 feed. You can leave a response, or trackback from your own site. Since at this point in time I’m the only person reading my stuff, I feel compelled to write a comment about the Oster 150-Watt 3-Cup Food Chopper listed in this article. When I found this on Amazon there were no reviews of the product. Since that time, several people reviewed the product and a basic flaw seems evident. The chopper cannot hold it’s rated 3 cups of a liquid. About half will leak out the blade shaft opening onto the motor housing. Chopping solids may not present the same problem. Given this kind of information, the product may not meet your needs. Read the reviews and decide for yourself.